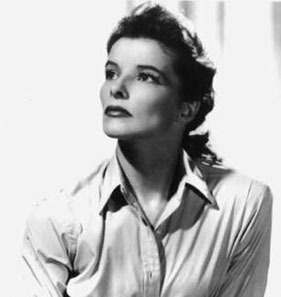 Katharine Houghton Hepburn was born in Hartford, Connecticut on May 12, 1907 to parents Dr. Thomas Hepburn and Katharine Martha Houghton. She was one of six children, all of whom were given their mother’s maiden name as a middle name. Her father was a successful urologist and her mother was a suffragette and outspoken proponent of women’s rights. Katharine and her two sisters were encouraged by their parents to exercise their minds and bodies, as well as to speak their minds. All the girls participated in golf, swimming, riding and tennis. Katharine experienced a terrible tragedy at the age of 14 when she found her older brother, Tom, dead after what appeared to be an accidental hanging. Katharine became depressed and withdrawn and was home-schooled as a result. For many decades she used her brother’s birth date of November 8th as her own. She attended Bryn Mawr College in Pennsylvania where she studied History and Philosophy. While attending Bryn Mawr, she decided she wanted to be an actress and acted in many of the school’s productions. Katharine was a free spirit, getting suspended for smoking (considered unladylike at the time) and breaking curfew. Later in life she admitted to swimming naked in the college fountain. She graduated in 1928, the same year she appeared in Night Hostess on Broadway. 1928 was also the year Katharine married 29-year-old Ludlow “Luddy” Ogden Smith, a wealthy Pennsylvania socialite and businessman. Katharine was unable settle down to married life in Pennsylvania and did not want children. Within two-week’s time she returned to her job as an understudy on Broadway. In 1934 she and Smith were divorced, although they remained very good friends until his death in 1979. Katharine’s performances on stage began to get her noticed. The part she played in the stage production of A Warrior’s Husband in 1932 earned her outstanding reviews. She was offered a film role in A Bill of Divorcement, released in 1932 and starring opposite John Barrymore. The film was successful, leading to Katharine signing a contract with the RKO Pictures movie studio. In 1933, her role in Morning Glory earned her an Academy Award. Next was her very famous role in Little Women (1933). Stories began to circulate about Katharine’s nonconformist behavior off-screen. She refused to wear makeup or anything but slacks on her own time, refusing to play the Hollywood “game”. Ironically, the attitude that makes her so popular today resulted in turning audiences against her at the time. After several flops, she was considered “box office poison”. Katharine revived her career after returning to Broadway to star in The Philadelphia Story. It was a huge success, and with the help of her friend, Howard Hughes, bought the movie rights and, in turn, sold them to MGM. She received an Oscar nomination for her performance in the film that was one of the most successful movies of 1940. Katharine appeared in 9 movies with Spencer Tracy. 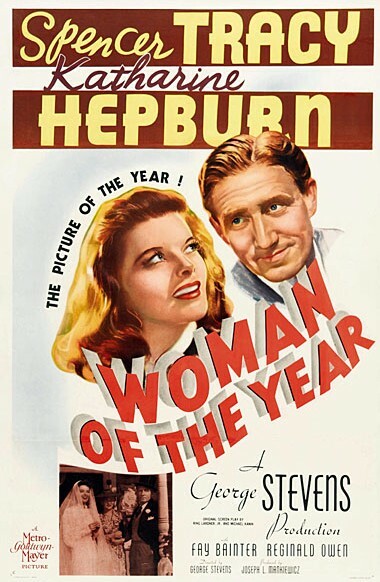 In 1942, Katharine starred opposite Spencer Tracy in Woman of the Year – a performance which earned her a fourth Oscar nomination. 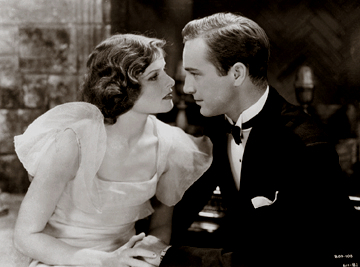 During filming, Katharine and Spencer began a love affair that lasted until his death in 1967. They appeared in a total of nine films together over a period of 25 years. There was a fifth Oscar nomination for Katharine’s 1951 role as the middle-aged spinster, Rose Sayer, in The African Queen opposite Humphrey Bogart. More Oscar nominations followed with her performances in Summertime in 1955, The Rainmaker in 1956, Suddenly Last Summer in 1959 and Long Day’s Journey Into Night in 1962. Her role in the unforgettable Guess Who’s Coming to Dinner, with Spencer Tracy and Sidney Poitier, won her a second Oscar for Best Actress. Katharine Houghton, who played Hepburn’s daughter in the movie, is actually her niece (her sister Marion’s daughter). This was Spencer Tracy’s final film, as he passed away shortly after filming ended. Katharine was nominated for a tenth time and received her second Oscar Award. Her eleventh Oscar nomination and win was for her performance as Eleanor of Aquitaine in The Lion in Winter (1968) with Peter O’Toole. In the 1970s Katharine started appearing in television movies, such as The Glass Menagerie (1973) and Love Among the Ruins (1975) with Lawrence Olivier. She did the movie On Golden Pond in 1981, with Henry and Jane Fonda, and received her twelfth Oscar nomination and fourth win. Over the course of her career, Katharine was nominated 12 times for an Oscar, and won 4 times (she’s the only actress to do so). Katharine’s autobiography, Me, was published in 1991. Shortly thereafter she retired from public life. She died at the age of 96 on June 29, 2003. In 1999 she was named the “greatest female star” in the history of American moviemaking by the American film Institute. She will always be an example of a strong, outspoken woman and an incredibly talented actress.